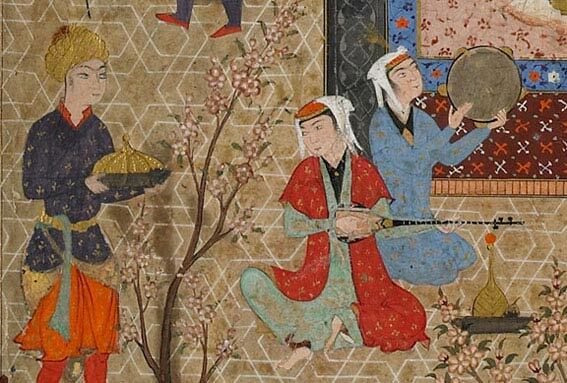 Norooz (also known as Nowrouz) is the only festival that is still celebrated across the entire “Iranian World”; meaning the world that was once defined by the boundaries of the Iranian Empire and the land on which Iranian culture remains alive. The term “Iranian World” remaining from the late Iranian archaeologist Shahriar Adl (2) refers to a geographical region that covers today’s country of Iran as well as Afghanistan, Tajikistan, Uzbekistan and even parts of India and what was once known as the Ottoman Empire. jashn” stems from the Avestan words yasn, meaning celebration, worship and yasna is one of the five major parts of the Avesta. Thus, the Norooz festival is a time for gratitude, and the veneration offrashkart meaning the renewal and resurrection of the Earth. 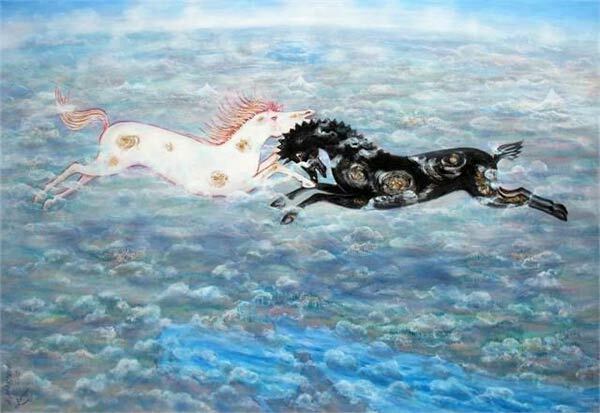 One of the most ancient Iranian myths associated with the resurrection and rebirth of nature is that of the god Rapithwin meaning midday) which has some similarities with the story of Jamshid and highlights the importance of midday as the gah (time) when the universe was created. It is at this gah on the day ofAhuramazda (also written as Hormozd, the first day of each solar month) in the month of Farvardin (first month of the solar year) that Ahriman (Sheytan, Shaitan, Devil)assailed for the first time upon the existential realm of Ahuramzda (Mazdian existence) and blended existence (duality) appeared for the first time. The time of midday, is the time of warmth and Rapithwin is the god (izad) presiding over all that is warm on earth; among the seasons, summer belongs to it. With the arrival of cold weather and winter, Rapithwindescends into the underworld to keep the roots of trees and the underground waters warm. It is for this reason that there are two feasts held for Rapithwin , one at the time of its descent into the underworld which is a farewell festival celebrated at the end of the month of Mehr (21 October), and once again at the beginning of spring when it emerges from the Earth. 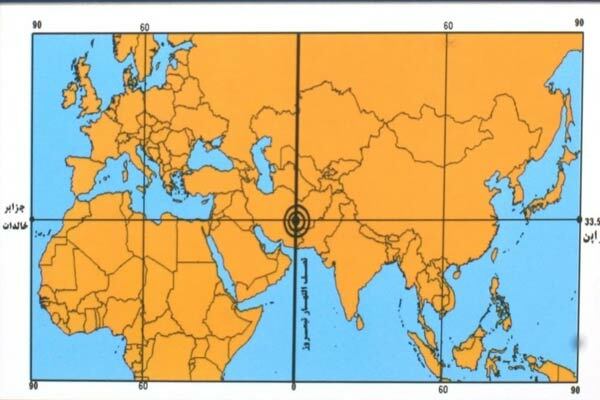 Of the four cardinal directions, Rapithwin governs the south and it is for this reason that ancient Iranians referred to the southern regions as “midday”, and ancient texts tell the story of Jamshid’s expansion of the Earth toward the south in the direction of the sun at the time of Rapithwin. The gah of Rapithwin is one of the five daily designated times of prayer and worship in the Zoroastrian religion; the first gah is Havan gah which starts at sun rise and continues till midday; then the gah ofRepthwin starts at midday and continues until the afternoon and is followed by Uziran gah, which is from the afternoon until sunset; with the appearance of the first stars in the sky until midnight is Aiwisruthremgah and finally Ushahen gah is from midnight until the disappearance of the last morning star at sunrise.The creation of the world by the hands of Ahuramazda also occurred twice, each time in six gahs (time/ sessions) known as the gahanbars; first in the spiritual form (the origin of Plato’s theory of Ideas and forms) and then in the material form. The anniversary dates of creationswere celebrated six times a year as five day feasts (gahanbars) and are still observed by Zorosatrians today. 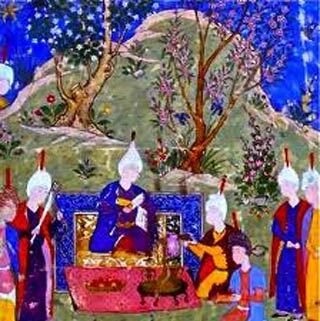 The annual feast of the creation of the sky, held from the 11-15 th of Ordibehesht (30 April-4 May) is the first gahanbar. The second gahanbar is the creation anniversary of water from the 11-15th of Tir (the first five days of July). The third gahanbar, the creation anniversary of Earth and the season of grain collection is observed from the 26-30th of Shahrivar (September 16-20). 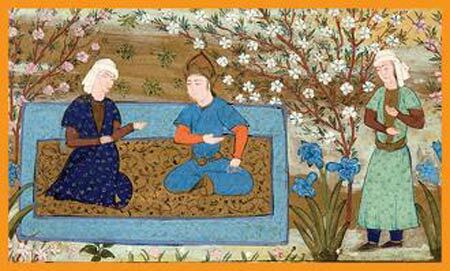 The fourth gahanbar is the creation anniversary of vegetation from the 26-30th of Mehr (October 16-20). The fifth gahanbar, the creation anniversary of four-legged utilitarian animals is from the 16-20th of Dey (January 16-20). And the lastgahanbar is the anniversary of the creation of humankind, observed on the last five days of the solar year. In the past, the anniversary of these last five days of the year, called the rite of Mir-e Noroozi, heralded the coming anniversary of the Day of Creation of the Universe. Today, the only remaining symbol of this rite and ceremony is the presence of the Haji Firouz (men with painted black faces wearing black and red suits) playing tambourine in the streets. 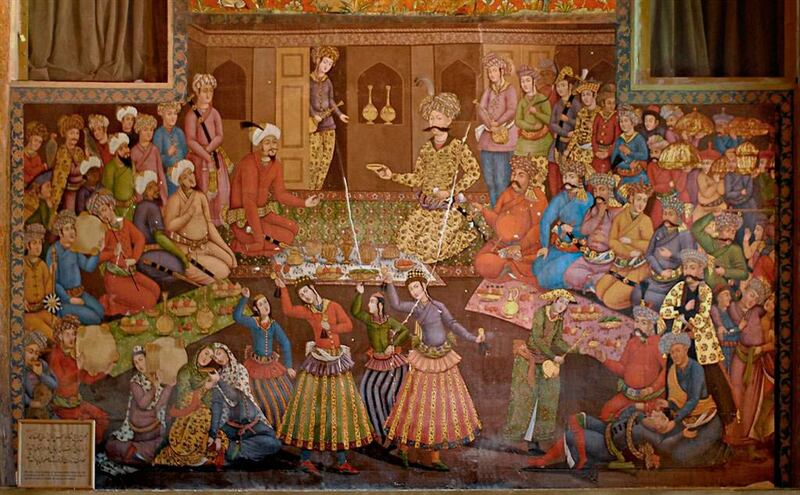 Wall Painting from Chehel Sotoun Palace, Esfahan, Iran, Safavid Period. However, in distant times, as a symbolic gesture to portray the Pre-existential Chaos (the moment in time when Ahriman assailed the creations of Ahura Mazda), in these last five days of the year, a Fool or a Madman was chosen to replace all rulers from the King to village heads and everyone was obliged to obey their orders. Naturally, during this brief period, the entire country would fall in a state of disorder and chaos, and at the end of these five days according to the ancient rite of human sacrifice, the Mir-e Noroozi (the fool or madman seated in place of the king) would be killed and sacrificed. 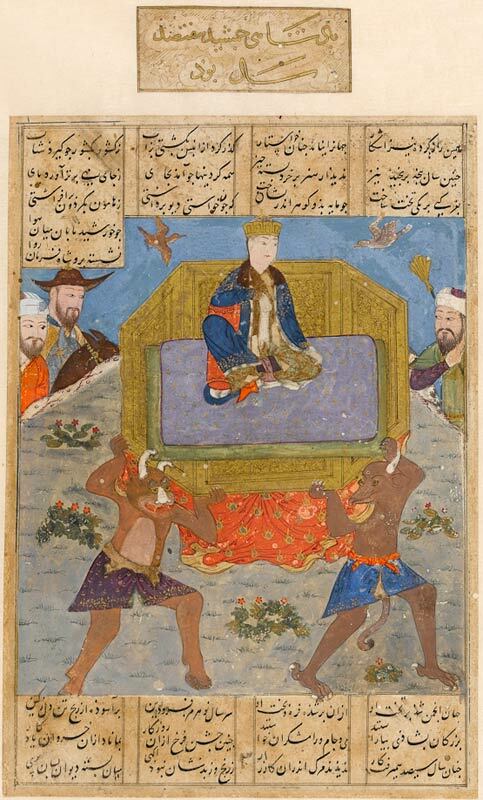 With the arrival of Zartosht(Zoroaster) who even opposed and fought against the Mithraic rite of cow sacrifice, this form of observing this tradition, undoubtedly fell away and now the period of darkness and chaos is represented through the black painted faces of the Haji Firouz and his red costume could be alluding to the rite of sacrifice and the falling of blood to the ground. The image is part of a mystical treatise known as the "Effulgences radiant splendors of Light." Detail, Lawa'ih (Effulgences of Light), Mir 'Ali, d. 1556; Nawwab Durmish Khan, Safavid period (ca. 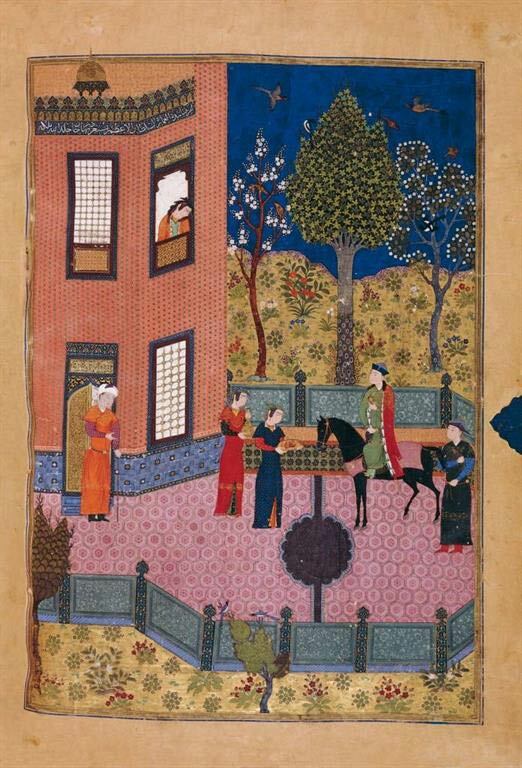 1521-1525); (origin: possibly Herat, Iran). As a symbol of nature’s awakening from winter sleep and death, culminating in resurrection, life and renewal (frashkart), Norooz is also the festival of fravahars. According to the Avesta, “fravahar” or “fravashi” is the divine force, particle, essence and one of the five parts of the human constitution which existed prior to the appearance of creatures and guides the formation and growth of the embryo through pregnancy and keeps all body parts in place until the time of death. After death, the fravahar rushes to the otherworld. All of Ahura Mazda’s creations, whether spiritual or material and even Ahura Mazada possessfravahar. However, fravahar, in its plural form stands for Pure Spirits and the spirit of righteous dead or the deceased and in the Bundahesh, following the previous excerpt recounted earlier in this article aboutRapithwin, it is mentioned that after creating all creatures in spiritual form, Hormozd consulted booy (baoda) (3)and fravahar of people and revealed to them His Omniscience and said: Which one seems better to you? If I create you in the material form to fight with Druj (Lie, Ahriman), and you destroy Druj(Lie), then I reward you with happy ending and will create you again in the world, without suffering from old age, death and enmity; or should you be guarded against Ahriman forever? Once becoming aware of the Knowledge of All and Everything, they foresaw how fravahars of people would suffer from the malevolence of Druj, Ahriman in the World. They also foresaw the final salvation from the enmity of that Evil Devil, and final resurrection in an eternal auspicious form, thus they all decided to take physical bodies. The Farvardin Yasht of the Avesta speaks of the Pure Spirits and in the words of Ahura Mazda “It is by rays of light and emanations of the fravahars that I hold the Sky high and the Earth can hold upon its shoulder the great vastness of the material world (Giti); it is by the rays of their light and their emanations that children stay alive in mothers’ wombs, that waters do not dry, plants grow, the sun, moon and stars continue on their paths...”. The fravahars return to the Earth once every year before the beginning of the month of Farvardin which is the month of fravahar:” We praise the beneficent (spenta), good and powerful fravahars which at the time of Hamaspathmaidyem (the last gahanbar) fly from their resting grounds and for a period of ten consecutive nights dwell here.” Spring cleaning, wearing new clothes, laying down a Haft Sin (4) and... (in addition to being each a symbol of the various phases of nature) are also gestures welcoming thefravahars. In the past, at the beginning of the last five days of the last gahanbar, or based on other accounts, at the end of these five days, on exactly the eve of Norooz, fire lighting ceremonies were performed on top of rooftops. This act of lighting fires on the rooftops was common among Iranians for a long time after the arrival of Islam and nowadays it is performed on the eve of the last Wednesday of the year and is known as Chaharshanbeh Souri. Souri is a fragrant species of red rose, recalling the red “flowers” of the fire. The first twelve days of this feast symbolize the twelve months of the year and the twelve thousand years of blended existence and battle with Ahriman. And the thirteenth day is a symbol of the thirteenth millennium and the beginning of salvation from the material world and return to heavenly paradise; going out to gardens, meadows, prairies and pastures on the thirteenth day can also symbolize this final passage to heavenly paradise. Besides, in Zoroastrian time- keeping the thirteenth day of each month is named after Tir (Tishtar) the goddess or guardian angel of the rain and four-legged animals which during rushes of drought and scarcity brought about on Earth by Apausha, the drought-bringing div (demon), rises with the help of Ahura Mazda, defeats Apausha and thus the life-giving rain starts pouring down on Earth. And this can be another reason to go out to Nature’s lap on the thirteenth day in order to worship and offer prayers to Tir goddess for bringing rain and greening the fields. And again according to him “Norooz is a ceremony which is in of itself made up of lesser ceremonies such as the Reign of Women (Mardgiran), the Reign of Mir-e Noroozi, Norooz Collaboration, Festival of the Dead, Day of Abstinence, Day of Lying, Norooz-e Pahlevani (athletic) races, Norooz games, Norooz dishes, Norooz bread baking, theatrical animal shows, theatrical prayer and worship, youth and children’s theatrical shows and good news/ annunciation shows” many of which one can barely find a remaining footprint. For more information about The Iranian World, See, Shahriar Adl, Tavoos Featured artist. Booy, boy, baoda in Pahlavi language means to know and to smell still used in today’s Farsi both literally and idiomatically as in English. For more information see Avesta, Farvardin Yasht and Selections of Zadspram, translated into Farsi by Rashed Mohasel, The Institute of Cultural Research Studies, Tehran, 1364 (1985). pp.40-52). In this article, the direct quotations are from: Farnbagh Dadegi, Bundasheh, translated into Farsi by Mehrdad Bahar, Toos Publishing, 1369 (1990). To enumerate all the other resources that the author has used would be like listing all the articles she has translated for Tavoos and the additional articles and books she had to read for this purpose and also her life long research on the Zoroastrian Religion. The quotation from Houshang Javid is from his article: A glance at Norooz Rituals and Ceremonies, Art and Architecture, No.174-175. Farzaneh Goshtasb, Time of Rapithwin, the ideal time in Zoroastrian Religion, Berasad, Zoroastrian News and Analysis Website.